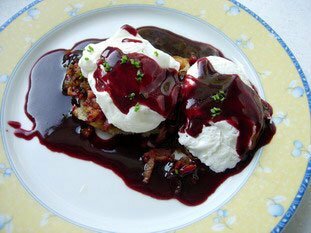 Eggs meurette or "œufs à la bourguignonne" is a great classic of French cooking, and of Burgundy in particular. It consists of poached eggs on a bed of fried onions and bacon, served on a slice of fried bread. This is topped with a tasty reduced red wine sauce.